I've taken a creamy-delicious summer potato salad and infused it with the flavors of fall! Pumpkin and crunchy sweet onion in each bite. Roasted tiny potatoes have crisp skins and tender flesh - perfect pairing with my creamy pumpkin sauce. Start your fall morning off right with this pumpkin pie oatmeal. Healthy and delicious with a swirl of coconut milk cream on top! Sometimes it is nice to take the guilt out of "dessert hour" by adding a little "nice" in your "naughty" dessert. These recipes inspire naughty/nice treats like Strawberries and Coconut Cream - and a chocolate molten cake that is nicer than it sinfully looks! Slideshow. I love this light version of a Pumpkin Pie Shake. The addition of fresh fall apple cider is the perfect touch to pumpkin spice flavors. Why should pumpkin get all the glory? 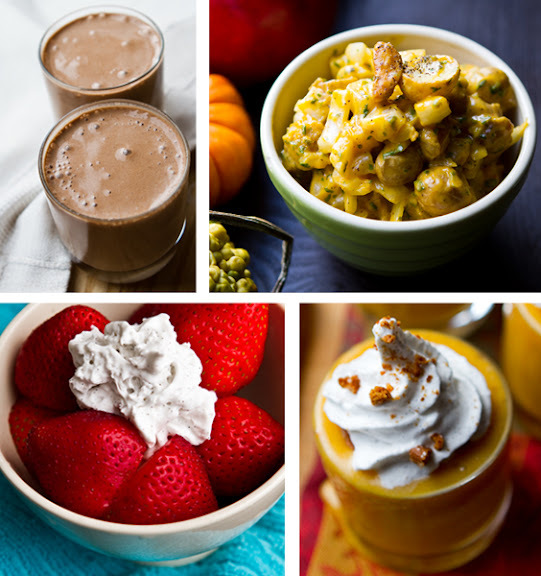 These ten squash recipes will leave you "falling" for squash - butternut, acorn and more! I love my Acorn Alfredo pasta..
Tal Ronnen and Art Smith craft a chef-approved, vegan-friendly menu for this casual dining/fast-food chain launching in Northern California this month. Plans to open 250 locations in the next 5 years means this menu may be coming to you! Go healthy and raw with this chocolate shake. Makes a delicious afternoon pick-me-up or breakfast sip! So rich and delicious that it's worthy for dessert too. Raw cacao is rich in antioxidants. A few fun kitchen tips on how to peel those pesky cloves of garlic..